The Dell Vikings were one of the first rhythm and blues groups to completely grasp the style of rock and roll. In doing so, they incorporated and homogenized both musical forms without diluting either. The original group had served together in the US Air Force. In 1955, they were stationed in at the Air Force installation at the Pittsburgh airport in nearby Carapolis. Singing together in their spare time brought a desire to hear for themselves what they sounded like. 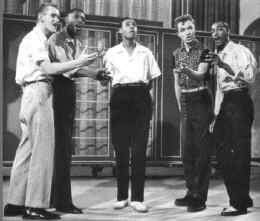 In October 1956, the group consisted of Norman Wright, lead tenor, Corinthian "Kripp" Johnson, first tenor, Don Jackson, second tenor, Clarence Quick, second bass; and Dave Larchey, baritone. During a rehearsal they recorded nine acapella songs in the basement of a local deejay and music entrepreneur, Barry Kaye. Listening to the tape they all agreed the sound was close, the style was coming around and all that was needed was a little more work. Three months later the group was in a downtown Pittsburgh's Sheraton Hotel in a makeshift studio set up by Fee-Bee records, a small local label owned by Joe Auerbach. They were backed by a pickup band of Air Force buddies. At the session they recorded "Baby, Let Me Know," "Come Go With Me," "True Love," "When I Come Home," "Don't Be a Fool," and "Watching the Moon." Their first release, "True Love" b\w "Baby, Let Me Know"came in the fall of 1956. "True Love" was a typical rhythm and blues ballad. "True Love" began receiving local airplay in early December prompting Auerbach to re-release it with a stronger B-side. During the second week of January 1957, the re-titled "How Can I Find True" was released with "Come Go With Me" on the flip side. In almost no time deejays flipped the record and discovered "Come Go With Me." The popularity of "Come Go With Me" began to spread from Pittsburgh to Youngstown and then Cleveland. With orders he couldn't fill Auerbach went looking for a distributor. Within three weeks a deal was made with Dot Records that allowed Auerbach to release small quantities on the Fee-Bee label locally with. the national sales for the Dell-Vikings being on the Dot label. Dot released "Come Go With Me" in the first week of February. Strong demand for the record saw it appear on the national charts within a week. In March, Fee-Bee had the group record about a dozen songs in a full sized studio in Ohio. Fee-Bee released "Maggie" b\w "Down In Bermuda." In Mid-April, Alan Freed invited the group to appear at his annual Easter-week Revue at the Brooklyn Paramount. A week later a re-titled "What Made Maggie Run" was issued as the group's second single on Dot. It attracted little airplay and few sales. Mercury records attempted to sign the group after it discovered that when the group had signed their exclusive recording contract with Fee-Bee only Kripp Johnson was over twenty one. This meant the younger members weren't bound to either Fee-Bee or Dot. With a chance for more money they signed with Mercury in May. In October Mercury and Dot settled their legal disputes with Fee-Bee. Under the final agreement Fee-Bee retained management rights to the group through December1, 1957, after which Mercury gained all legal rights to the group's name. Mercury didn't wait until December renaming the group the "Del Vikings." The result was that the the Mercury's Del Vikings and Dot's "Dell-Vikings" had singles released the same week in June. Mercury's "Cool Shake" sold moderately well. "Whispering Bell" was their third release on Dot. Like "Come Go With Me" it was wildly exciting. Fee-Bee recorded "I'm Spinning" with Johnson backed by a studio vocal. That came out in October on Dot with Kripp Johnson and the Dell-Vikings as the artist. . Mercury sued and won exclusive rights to the name no matter how it was spelled. In July 1957, it was reported that El Dorado Records was set to release an album of nine songs that was outside the Fee-Bee/Dot agreement. The basement tapes had surfaced. It isn't known what became of the El Dorado album, but the material was eventually overdubbed with instruments and released by Buchanan and Goodman on their Luniverse label using profits from "The Flying Saucer." Luniverse was sued by Dot and all the records were pulled off the market. With records being issued by four labels by three groups of Dell-Vikings they had three hit singles on the chart in August, 1957. No singer before Elvis had done that and no artist would do that again until the Beatles in 1964. However, there would be no more hits. The group appeared with Alan Freed's week long Labor Day revue at the Brooklyn Paramount. Shortly, thereafter they appeared in a cameo in the movie "The Big Beat," which was released in February, 1958. The ensuing years saw a constant change of personnel, moving labels , recording unsuccessful songs, and various groups calling themselves the Dell-Vikings.